Service Repair Manual Nissan Patrol Y60 1987 1988 1989 1990 1991 1992 1993 1994 1995 1996 1997 Workshop Manual pdf download. Is the same manual used by technicians at the dealerships to maintain, service, diagnose and repair your vehicle. 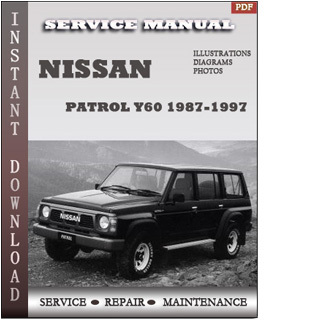 Nissan Patrol 1987-1997 Service Manual is very detailed and contains step by step instructions and repair info. To download 1987-1997 Nissan Patrol Repair Manual click on the instant download button, pay with your paypal/credit card and you will receive link to download .